Spent all day Saturday packing - mostly kitchen things. LOL…hope THE COUCH can fit this all in the new apartment. Leave Thursday morning for NJ. Pick up the U-Haul that day…load it all in and start the drive Friday morning with Matt. Will get back to Memphis early on Saturday, unload it all and then Sunday morning take Matt to the airport. It seems that almost a dozen Japanese tourist visiting Paris each year end up needing psychological treatment! Previous cases include a man convinced he was the French "Sun King", Louis XIV, and a woman who believed she was being attacked with microwaves, Japanese embassy official Yoshikatsu Aoyagi has said. The phenomenon, dubbed "Paris Syndrome", was first detailed in the psychiatric journal Nervure in 2004. You see…in Japan, shop owners treat the customer as kings and queens, while in Paris, the help is rude and hardly even notice them. Then they get on the subways and no one smiles and the crime is something the tourists are unfamiliar with. The Japanese think that Paris is a wonderland and that all French people are happy and friendly. Then they get there and see the reality…a dirty city with rude sullen people and it just makes the Japanese go a bit wack-a-doo! HA! We Americans already know the truth…a bunch of whiny sniveling blowhards who would be eating bratwurst and sauerkraut if it were not for us…. Coca-Cola syrup, a drizzle of strawberry syrup, and some strawberries. whipped cream, cinnamon sugar and a cherry on the top. "It tastes great," said Sue Gooding, a spokeswoman for the State Fair of Texas where Gonzales' fried Coke made its debut this fall. "It was a huge success." with "most creative" new fair food. other people are trying to emulate Gonzales' recipe. Seems this new creation is a hit all over the US at state fairs. Good old Abel will be working on his Sprite and Diet Coke recipes this off-season to try and reduce the number of calories in his creation. Ummm…Able, dude…you are selling these at the same place people gorge on fried dough, whipped sugar, fried pork fat and more…do you really think they give a dang how many calories is in your new creation??? Today marks the anniversary of the death of DUANE ALLMAN. Duane is another person whose abilities and talents have touched THE COUCH’s life. Thanks for the reminder Travis! THE COUCH has told the story of “meeting” Duane back around 1970 standing at a urinal at Stony Brook University on Long Island, but the short version for those of you who have not heard it. Was a concert where Mountain was the Top Bill. The opening act came out and just wailed. Some incredible music. Between acts, THE COUCH runs to men’s room and am standing there. Michael Ventre, MSNBC contributor, did a very special tribute to Duane today. We will quote from it, as he said it better then THE COUCH could. Outside of niches occupied by guitar fanatics and Southern blues-rock devotees, the name Duane Allman is often ignored. He wasn’t flamboyant. He didn’t live the stereotypical life of rock and roll excess. His most notable work came either as a session player for other artists, or as an unassuming member of a band he co-founded with his brother Gregg. And he is probably recognized the most for his work on the slide guitar, practically a lost art today. Yet Duane Allman — who died about a month shy of his 25th birthday, on October 29, 1971, 35 years ago — was one of the most influential guitar players of his generation. His untimely passing in a motorcycle accident only a few months after the release of the now classic album, “The Allman Brothers at Fillmore East,” was as much of a blow to the world of rock as any of the aforementioned icons. While Clapton is exceptionally good on “Layla,” Duane Allman’s slide transformed the album from an earnest homage to the blues that would provide filler during a lull in Clapton’s career into one of the landmark works of rock and roll. The memories of Duane Allman are clear and precise, just like his playing. There were few bells and whistles associated with him, no fuzz or tremolo effects to enhance the natural sound of his Gibson Les Paul. His picking was pure, much like that of the blues gods he emulated. That unadulterated style reflected his personality. He was, by almost all accounts, a good-natured soul with a big heart and a carefree spirit. It seemed that whoever came into contact with Duane Allman liked him, although he wasn’t very tolerant of nonsense and especially media attention. He was a pleasant individual, but a forceful and intense presence as well. Duane Allman wasn’t just a blues mimic. He developed his own Southern-fried rocking version of the blues. Fellow blues greats like Johnny Winter and Stevie Ray Vaughn — two Texans with generous splashes of Southern Comfort on their licks — became known more for the speed in which their hands picked and their fingers moved across the frets, although they are considered geniuses in their own rights. Duane’s strength was in his blues instincts. He chose his notes carefully, allowing space to breath between them, but still capable of hitting the accelerator when necessary and wailing. While some guitarists overwhelm a song with their power, Duane’s playing perfectly complemented the songs he played on while still projecting strength. Some of his long improvisations exhibit impeccable blues, rock and jazz influences, which is why “At Fillmore East” is such a staple in most music fans’ libraries. He had the confidence and passion of an accomplished artist, but he also radiated the loyalty and trust of a good brother and friend to those who admired him. Although it has been 35 years since he passed, his presence is still felt and his music is still relevant. In 2003 Rolling Stone magazine listed their 100 greatest guitarists. 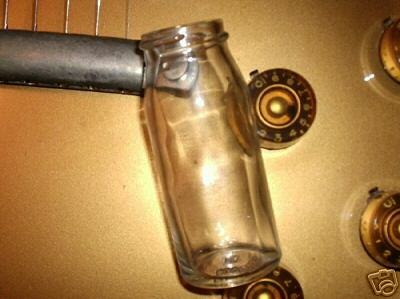 #1 was Jimi…#2 was Duane...ahead of all the rest. In 1998 the Georgia state legislature passed a resolution designating a stretch of State Highway 19 within Macon as "Duane Allman Boulevard" in memory of him. Shortly after Duane's death, Ronnie Van Zant of Lynyrd Skynyrd dedicated the song "Free Bird", which he initially wrote for a friend's wedding, to the memory of Duane Allman. After Duane died, they called the next album Eat a Peach for one of Duane's interview lines, in response to the question "How are you helping the revolution? ": "There ain't no revolution, only evolution, but every time I'm in Georgia I eat a peach for peace." The album was NOT called Eat A Peach because it was a peach truck that Duane hit with his motorcycle as legend speaks. In a bizarre coincidence, bassist Berry Oakley would die 13 months later in a similar motorcycle crash with a truck, not but three blocks away from the site of Duane's. 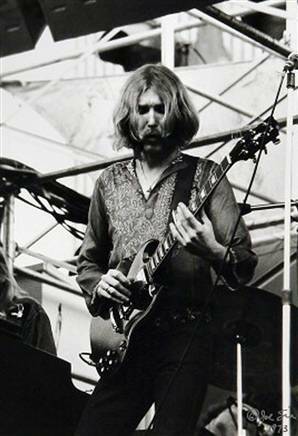 Eric Clapton invited Duane to join Derek & the Dominoes after the Layla sessions, but Duane declined, preferring to stay with his brother and The Allman Brothers Band. Finally…You may not know it, but you probably have heard the sweet sound of Duane’s guitar and slide work on some of your favorite songs. He worked as a session musician at the Muscle Shoals Studios in Alabama for a period of time before the ABB came into being. What could have been if he had continued playing over the last 35 years…. "In protest of France's opposition to a U.S. war on Iraq, the U.S. Congress' cafeteria has changed french fries and french toast to 'freedom fries' and 'freedom toast.' Afterwards, the congressmen were so pleased with themselves, they all started freedom kissing each other. In a related story, in France, American cheese is now referred to as 'idiot cheese.'" —Tina Fey, Saturday Night Live's "Weekend Update"
P.S. Could it be that a group of Parisians are running the Wendy's up the street from me? DH goes there a lot and he swears he hears radio stations transmitting through his dental implants after going through their drive-through-from-hell. DAY-UM...I'm calling Le Nervure!!! P.P.S. Had no idea that Duane Allman played on Boz Skaggs "Waiting For a Train"...OMG, I wore that Boz album OUT!! How could I not like fried Coke? I normally detest anything Michael Ventre has to say, but there's no doubt the guy wrote a worthy piece on a master player. Thanks for the list of songs. Duane Allman, Taken Too Soon. COCO: See your friends are always there to help when you are swamped. How was Duane featured? because it was the anniversary of his death, or just coincidence? ANNDI: It is the French French not the French Canadians that have that slimy reputation...Love you girl...I actually changed French fries to Freedom fries at the Little League that summer and some kids still ask for them using the Freedom Fry name! Thanks, Vince for the great story you shared about Duane Allman! I got to see Stevie Ray Vaughn in Texas shortly before he was gone. He was so awesome. Then before moving here to MI. I attended the all day all night Clapton Blues Festival and saw so many Blues Legends. Hopefully one day soon, Taylor will join these Legends. Happy your trip home was wonderful! and believe me, I have my own issues with those Parisites, um, Parisians..
Um.. no mention of Italy and Mussollini?? I have ALWAYS said that at my memorial service that "Freebird" had better be played. I'm telling ya'll this and everyone I know... this is a MUST play!!!! Sorry morbid... but anything by Lynyrd Skynyrd.... OH YEAH!!!! 21 Hrs 32 Mins 56.8 Secs--of safety, unless of course, George wins again! No offense, but the DEMOCRATS have become the "Looney Left", and I think they just kinda want to hand the U.S. over!